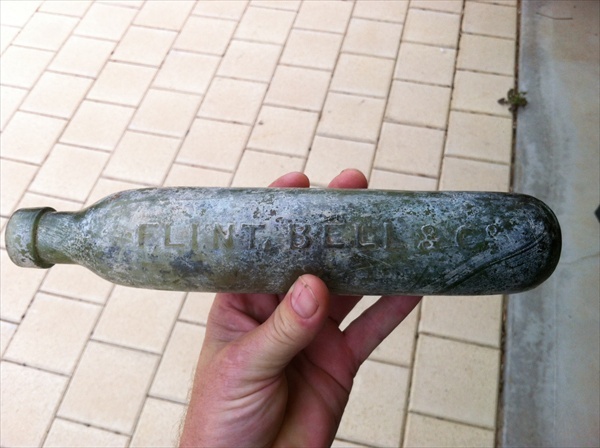 I recently was fortunate enough to be introduced to the excitement of finding a rare Flint, Bell & Co Adelaide Green Maugham (round ended bottle). Well to be honest it was my wife that found it at a garage sale and since receiving a pretty hefty amount of money for it my interest in digging old bottles has been ignited. 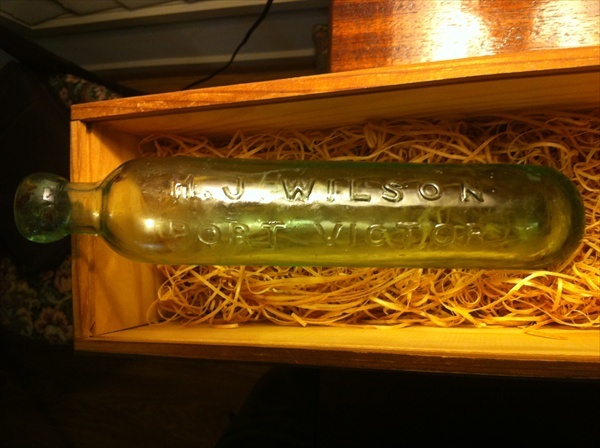 Back when I had my first business I remembered that Wayne the owner next door used to dig old bottles, I contacted him because I thought he may want to see the bottle before I parted with it. It turns out that seeing something that rare didn’t just spark an interest in me but it was enough to excite Wayne enough to get him back into bottle digging and since then we went to an old site I new of to see what treasure was there. 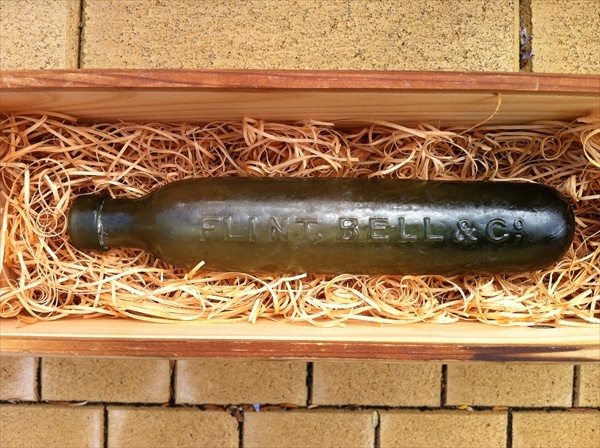 The Flint, Bell & Co Maugham is the only one that is known to exist and therefore it was like finding the Holy Grail of South Australian bottles. 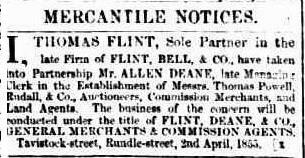 The company Flint, Bell & Co were merchants of all sorts of items operating from premises in Rundle St & King William Street Adelaide in 1855. This was a great South Australian find because it was a new discovery and looked like possibly being Bottle of the Year at the up and coming National Bottle show. Articles turned up from early news papers, firstly part of a cargo list with 1 case being shipped to South Australia by a company Flint, Bell & Co in 1852 as part of the Cargo of the Admiral Boxer, from Liverpool— 1 case, Flint Bell, and Co.; Now at first we thought this was saying that a case of Flint, Bell & Co bottles had been shipped over but later discovered that it was how the manuscript were written, a list of what was on board with the owners name written after it. Secondly, the two parties traveled to South Australia on the same ship in 1853 as you can see from part of the passenger list below. 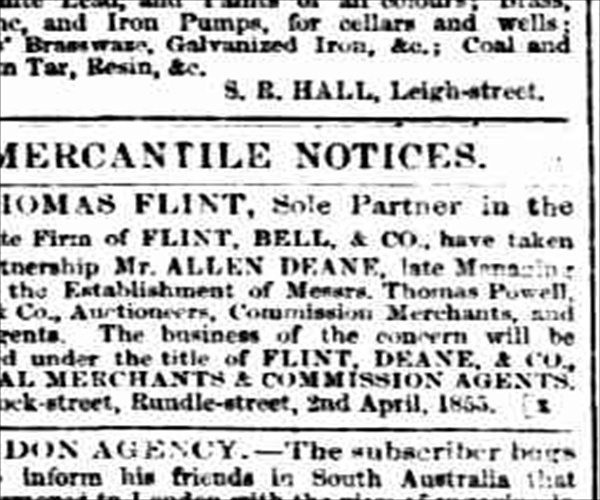 Thirdly information regarding Flint, Bell & Co taking on a partner with the clip below showing the premises at Rundle Street in 1855. 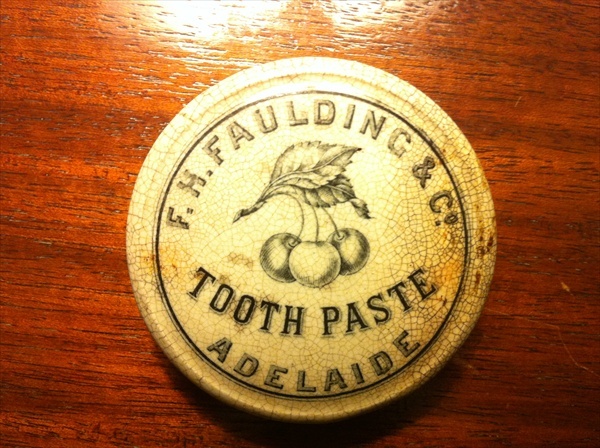 So it was almost official that it was a new discovery of a South Australian Company that set up business in Adelaide shortly after arriving together in 1853. Then the final pieces came together proving the authenticity of this Adelaide Maugham, Thomas Flint 1874-1859 and Jeremiah Bell – listed as merchants and import/commission agents of Rundle Street; seemed to operated between 1852-1855 although the company continued on trading under the same name when Jeremiah Bell left the partnership and they then operated as Flint, Deane & Co from April 1855 until Flint’s death in 1859.Thomas Flint also established the Adelaide Institution for Young Ladies The Institution for Young Ladies was run by his sister Mrs J M Bell [wife of Jeremiah Bell] assisted by his daughter Miss Amelia Flint. The feeling I get when something like this is found, with such historical significance is nothing short of amazing, to be part of putting a piece of early history together is so rewarding. That is why I now have what they call, the bottle digging bug and fortunate enough to be able to dig many of the old sites I have been detecting over the last couple of years. 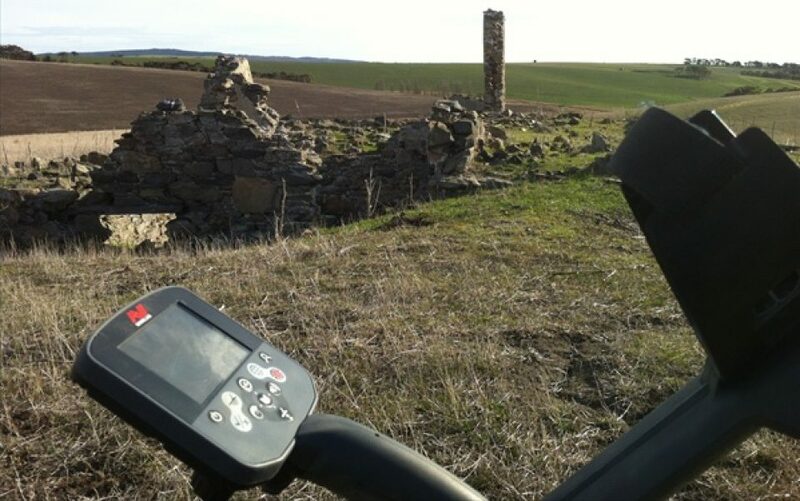 Although I had been out on a couple of small digs with a friend from Whyalla I didn’t really think much of it until now, dare say due to the possibility of what can be found buried in old dumps. My first organised actual dig was with Wayne at a site where I knew there was on old dump in a small wash out of a ravine. We did exceptionally well and I am now well and truly bitten with the digging bug. 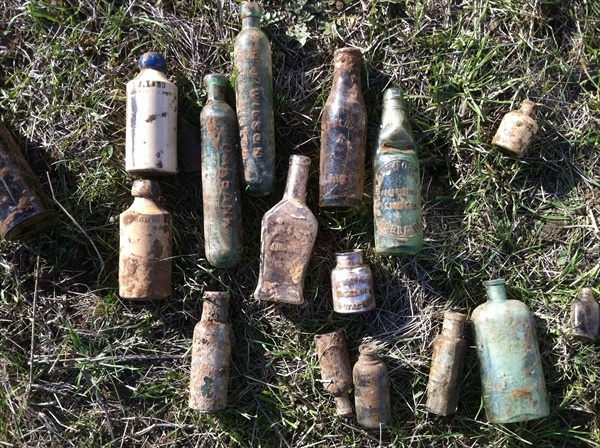 We found over a hundred bottles ranging from between 1880 and 1940 with some being great pieces and others what they call over the shoulder bottles. The best was a Faulding’s pot lid that there are evidently only three known of including this one, this makes it quite a valuable item and sort after by collectors. 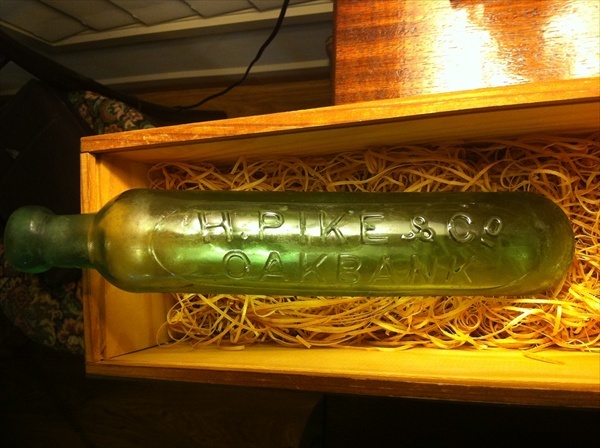 We also found some great embossed pieces including a couple of Maughams, a H .J Wilson Port Victor (Victor Harbor) and a H . Pike & Co Oakbank in very good condition. I will have to admit it it a great feeling to find detecting treasure but it is equally as much of a buzz digging bottles, I am officially hooked and it is now in my veins, Mwhaaaaaaa the bug bites deep. Stay positive and happy treasure hunting. Mark I still wonder who blessed you with a big tin full of Ar$e but fantastic story Im looking forward to the next instalment.